The Irish Government has launched a new food waste initiative to halve the food waste dumped here every year by 2030. This initiative was put in place by Minister for Communications, Climate Action and Environment, Denis Naughten. The initiative includes leading retailers, who will be asked to agree changes in policy and practice that have an impact on cutting down food waste. According to the Indpendent.ie ‘around 40% of wastage comes from food production, while 60% comes from the household and commercial sector. St. Patrick’s Day is nearly upon us. Barna Recycling will be collecting bins as normal this Friday the 17th March. 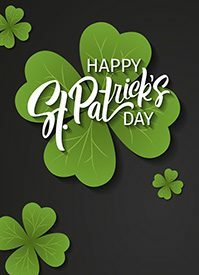 Please make sure to put your bins out the night before as some areas may be serviced earlier than usual due to the St. Patrick’s Day parades. A recent news report from RTÉ has indicated that 160 containers of recycling bin waste was returned to Ireland from Rotterdam last month. The waste was en route to paper mills in China but was sent back due to contamination. The waste was returned for containing a mix of paper, cardboard, plastic and other materials. The Department of Environment will be launching a public awareness campaign in the coming weeks to encourage further waste segregation.